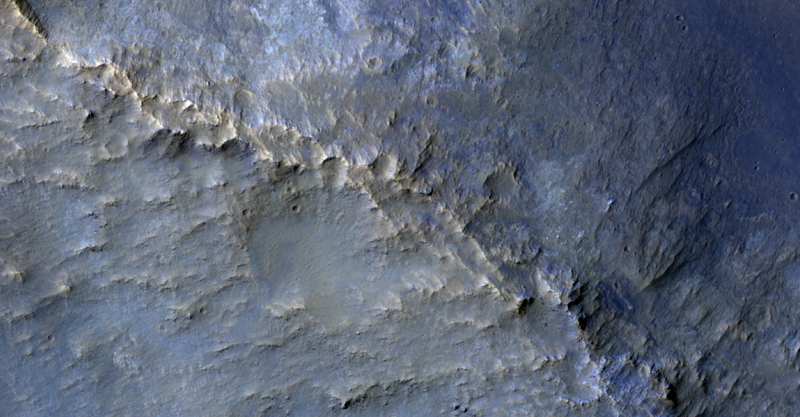 In this Context Camera image in Terra Cimmeria, we see a 30-kilometer diameter crater, filled-in with materials that created bedrock, and through subsequent erosion, wind-driven particles. 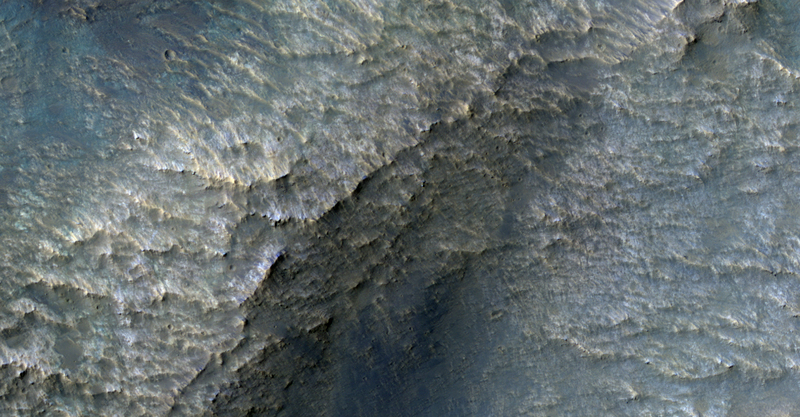 There is a ring of exposed light-toned bedrock at the base of the crater wall. 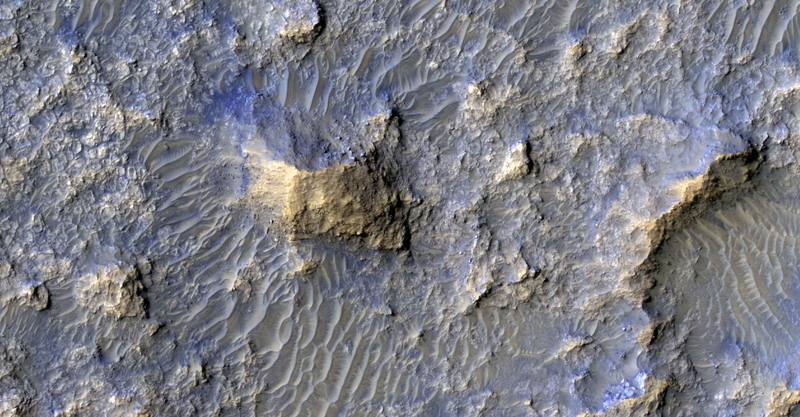 This distinctive ring suggests high winds climbing up the crater wall slope may be responsible for the erosion and the extent of bedrock exposure we see. 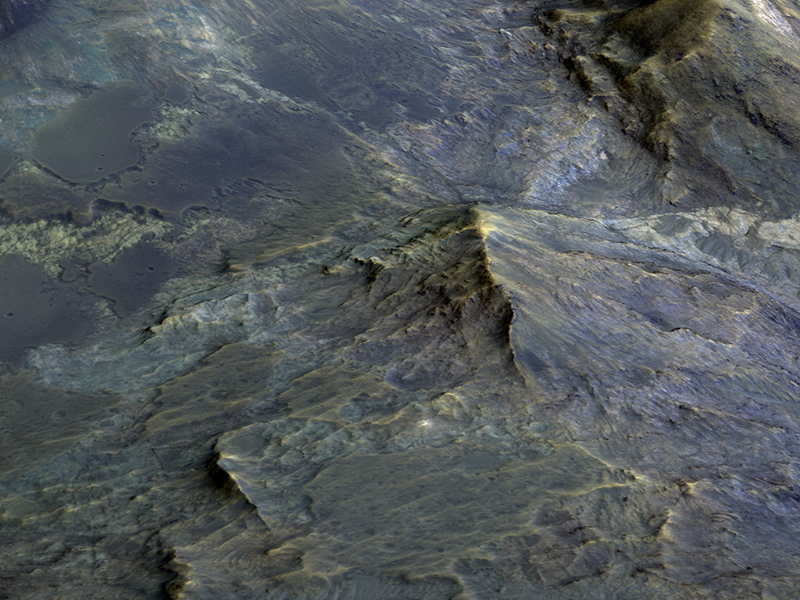 A close-up on the southeastern part of these deposits shows a mound of bedrock with beautiful color contrasts. The variation in color represents diverse minerals in the rock. 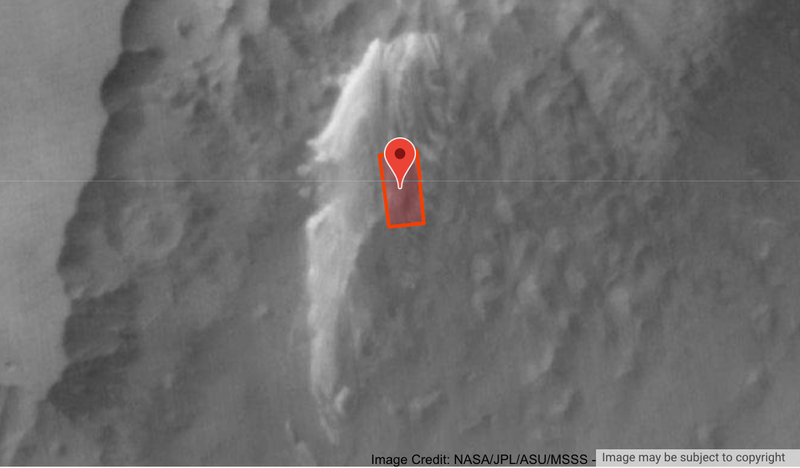 There is also a small degraded crater (about 300-meter diameter) to the left of the exposed bedrock. 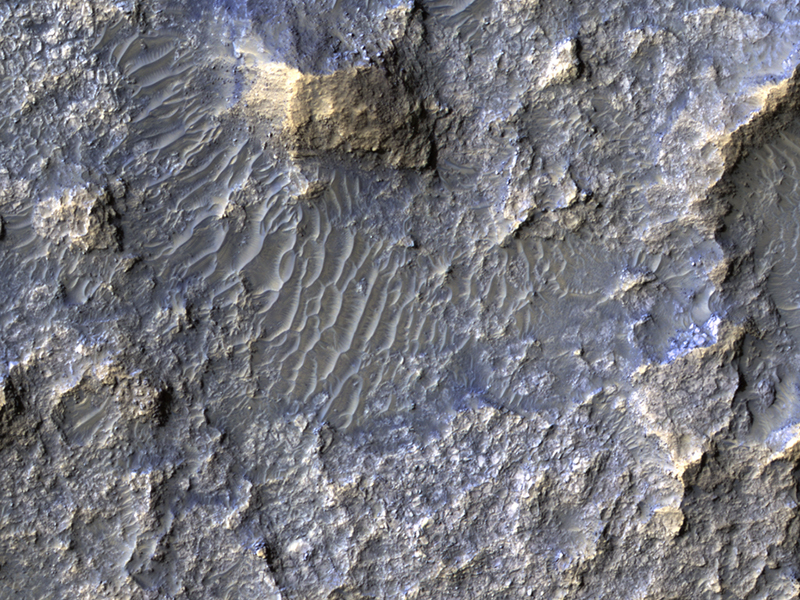 Fine-grained materials trapped inside the crater appear as wind-driven ripples or small dune-forms. 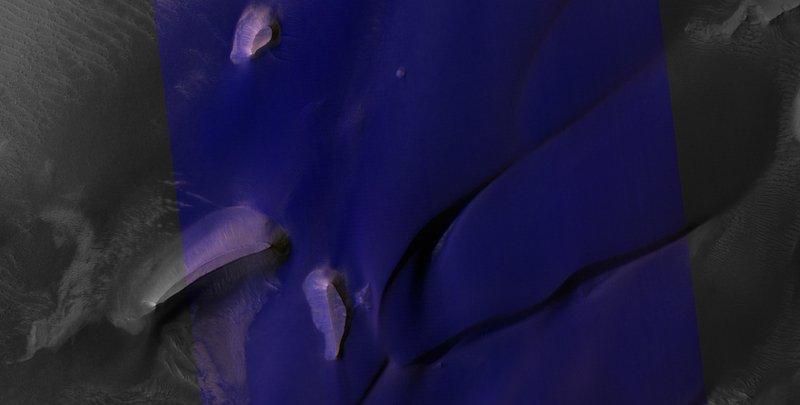 The ultimate origin of the sediment that forms Martian dunes has long been debated. While sand dunes on Earth are primarily sourced by quartz-bearing components of granitic continental crust, it’s often suggested that sand on Mars derives from eroded volcanic flows or sedimentary deposits, but exact sources are often vague. 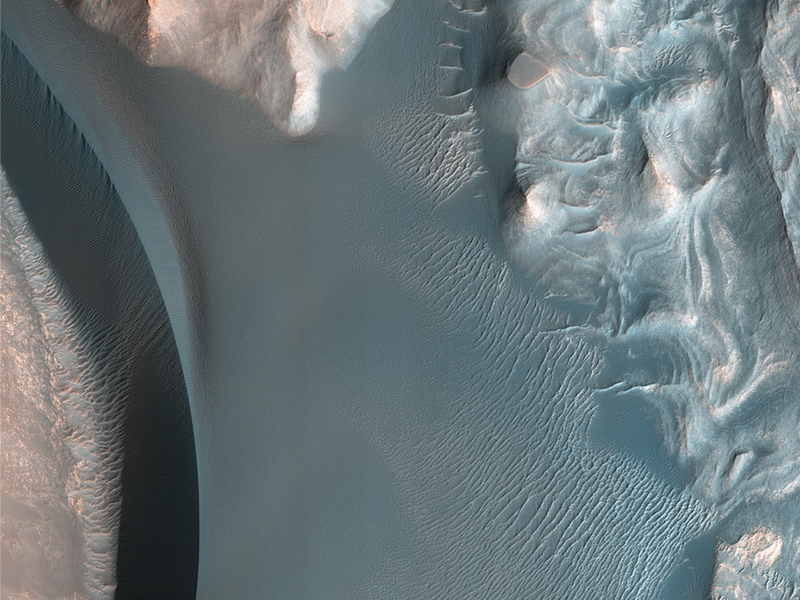 This image reveals a unique situation where this small dune field occurs along the summit of the large 1-mile-tall mound near the center of Juventae Chasma. The layered mound slopes are far too steep for dunes to climb, and bedform sand is unlikely to come from purely airborne material. Instead, the mound’s summit displays several dark-toned, mantled deposits that are adjacent to the dunes and appear to be eroding into fans of sandy material. 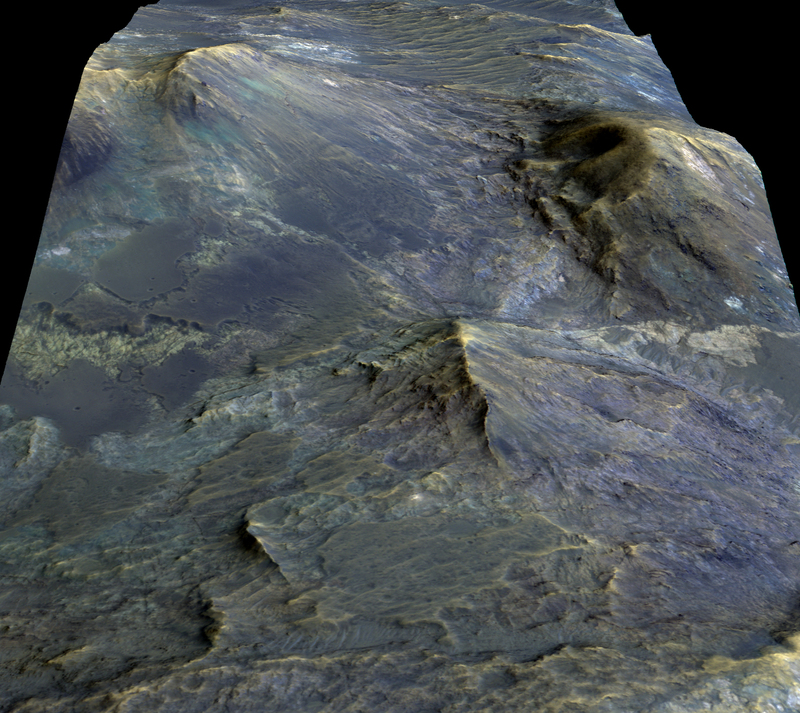 Along with local HiRISE images, spectral data from other instruments on MRO have confirmed such units are likely to be the sand source for these mound summit dunes and reveal how landscape evolution on Mars might occur. Sometimes, we observe similar rocks in the crater wall terraces. Some areas of the terrace show dark-toned materials coating and surrounding the white- and green-colored bedrock. This dark-toned rock was the once-molten material that was produced by the tremendous energy generated during the formation of the crater. Similarly, the impact melt material coats and surrounds the higher-standing bedrock of the peak. 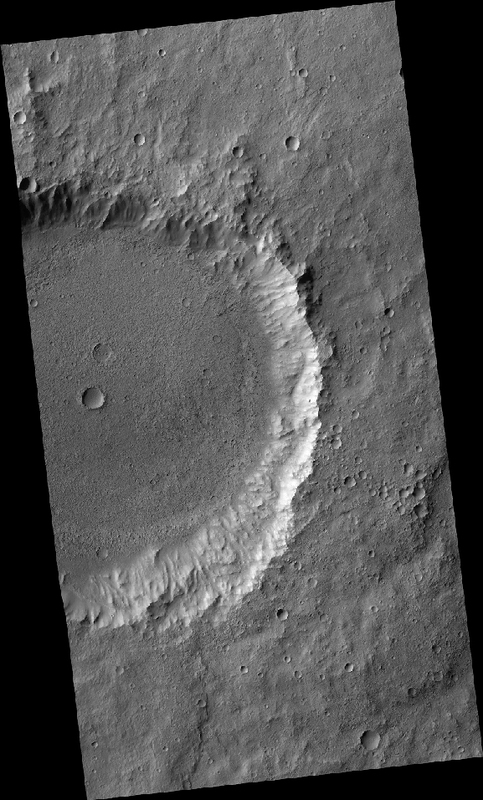 There are additional exposures of bedrock in the northern wall-terraces of the crater. 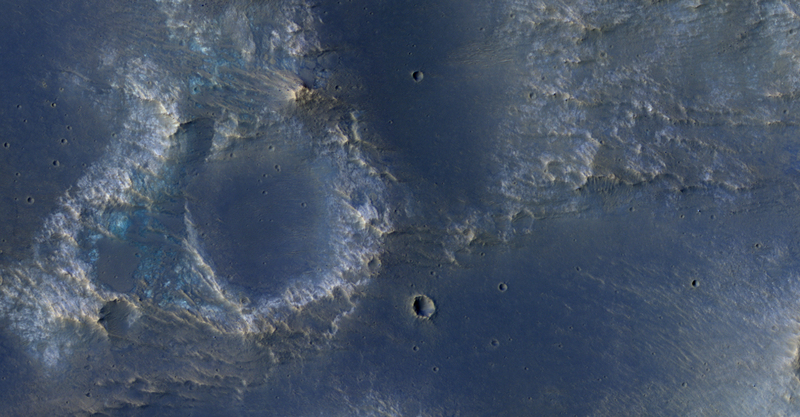 Previous HiRISE images have focused largely on central structures, but clearly the wall-terraces of these craters may also be informative in our exploration of the Martian subsurface. 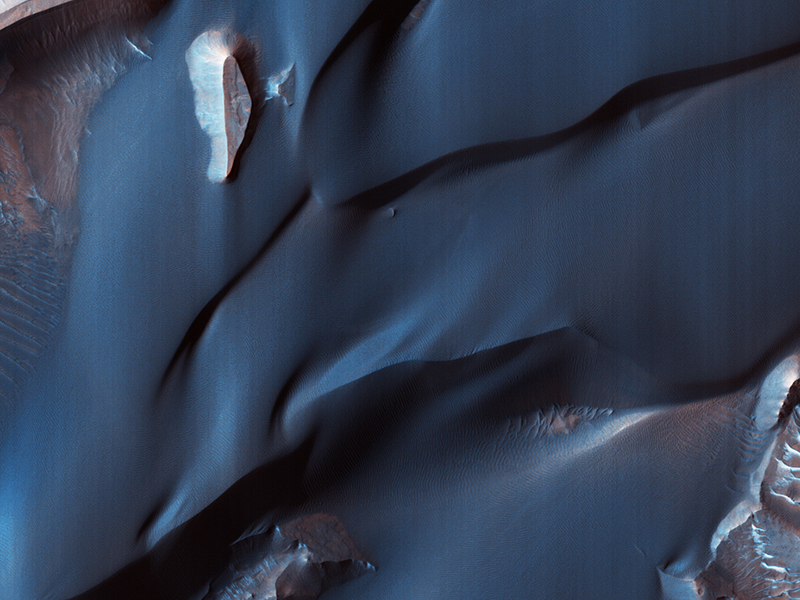 This color-infrared image shows sand dunes in Melas Chasma, located within the Valles Marineris canyon system. The dark-blue and purple colors indicate coarse-grained sands that are comprised of basalt, an iron and magnesium-rich volcanic rock that formed from cooled lava millions of years ago when volcanism was an active process on Mars. Migrating sand dunes often lead to the erosion and excavation of underlying material; regions where there are active dune fields are ideal places to search for exposed bedrock. Repeated imaging of dunes may also show changes that provide evidence for active surface processes related to wind patterns and climate.